Greetings readers of the internet! It’s that time of the year again, and I figured the best way to celebrate the halloween season is hopefully a FINAL trip down FNAF lane. I won’t lie to you readers, I was surprised when Scott Cawthon announced a fourth and final installment to his series of horror games. I was befuddled by the idea of having to write another article after the “explosive finale” that was the FNAF 3 article. But halloween is one of my favorite holidays, if not my favorite. What better way to celebrate than the final chapter of the Five Nights At Freddy’s storyline as in the last article, I’m skipping to the story. At first glance, this story is very lackluster and mediocre comparison to the other games. It seemed that everyone lost interest in the story, and while this game doesn’t reveal the identity of the purple man, it builds on some pretty big ideas that were toyed with in the previous installment. 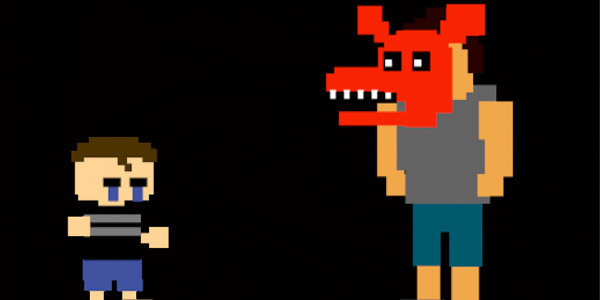 I should probably clarify where and when this game takes place in the timeline of Five Nights At Freddy’s. The posters and teasers of the game said the events of this game claimed that you were in 1987, where we would learn who was responsible of the bite and who the bite victim was. 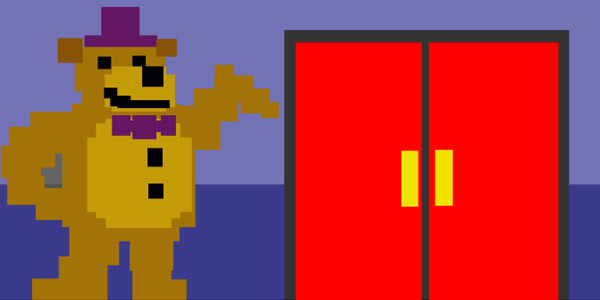 As in turns out, tiny little hints in Scott’s website coding and an easter egg involving the tv turning on, and tuning to a program, called “Fredbear and Friends” reveals that the year is 1983. And while it may be fun to go to the theater and see Return of the Jedi, this town’s idea of fun is to go to the local pizzeria. Now is a good time to explain that this story isn’t purple man centric, however he does make a cameo appearance helping an employee get into a spring suit (ironically, the same one he’ll get trapped in and die inside of). The protagonist’s older brother, gathers up his douchebag buddies and confront our protagonist at his birthday. The child is crying on the floor, wanting to leave the nightmares behind him. 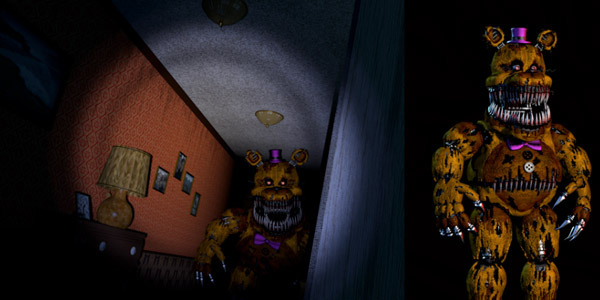 As a last horrible act, the older brother decides it would be funny to give his kid brother a close face-to-face experience with his tormentor, a spring lock Fredbear suit, who is currently in animatronic mode. 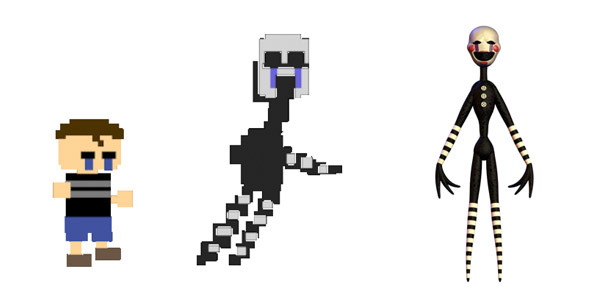 The child’s tears lubricate the suit’s springlocks enough to set them loose and crush the child’s head, resulting in the first time an animatronic was responsible for the harm or death of a child. 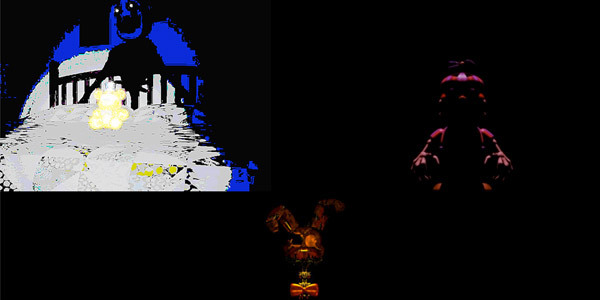 This isn’t the end of our protagonist however, as at the end of the 6th night, we see him talking to the ghostly Fredbear plush, who has been our only companion in this entire game. 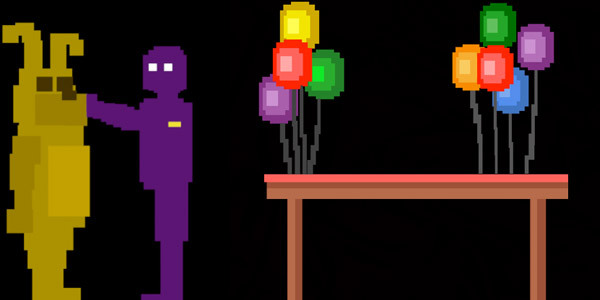 The resulting one-ended conversation is very pivotal to rest of the series, as the Fredbear plush up to this point has seemed like nothing more than an imaginary friend, a simple illusion of friendship to help the protagonist cope with his horrible life. It starts to put out thoughts of its own, and it has some very creepy things to say, such as “Can you hear me? I don’t know if you can hear me. 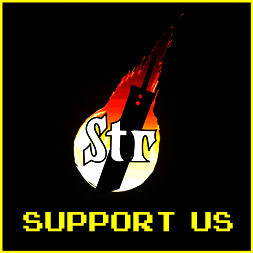 ….I’m sorry.” and “We are still your friends. Do you still believe that?”. Of course the topping on the cake are the lines “You’re broken. I will put you back together”. It’s pretty clear that this is no longer a figment of a child’s imagination, no this is a different being. Who? 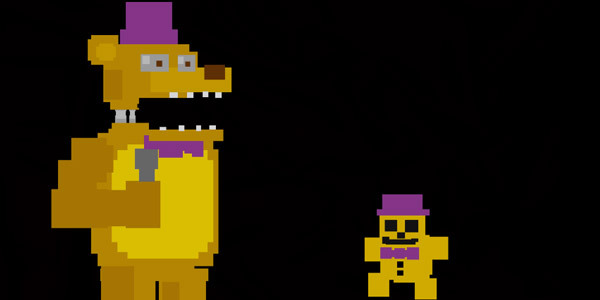 The purple man’s first victim, who would go on to possess Fredbear, or Golden Freddy. Freddy appears on, or rather under your bed. He is probably the one who will least likely kill you, which is odd because he is the POSTER BOY of the entire game. He sends his tiny minions up onto your bed, one at a time until all three are on your bed for a period of time, then he will commence his attack. To ward him off, you have to check your bed and shine your flashlight at his smaller counterparts, causing them to zip off your bed. 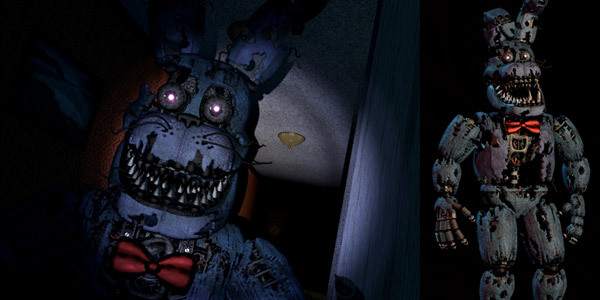 Bonnie starts at the end of the left hall, and quickly moves down the hall towards you, if he is directly at the door you with hear his breathing noise, which sounds a bit like two stones grinding together; If you don’t check him frequently enough, he will move into your room and jumpscare you inside. If you happen to flash your light in the left hall and see him move at the end of it DON’T SHUT IT. He will move straight to your door and kill you. Chica behaves the same as Bonnie, except she heads down the right hallway instead of the left one. She actually starts in the kitchen, once you hear the rustling of dishes and pots as well as the sink running in the kitchen, you know she’s now heading your way. Once she gets in your doorway, she sends her cupcake into your room to finish the job. Ah, good old Foxy. His behavior is a bit unique from the rest of the animatronics. His attacks happen in multiple phases just like the first game. First he has to get in your closet from the left hallway (hence why you’ll occasionally see him retreat behind a wall in the left hallway). Once he’s in your closet, he’ll stay there for the rest of the night. 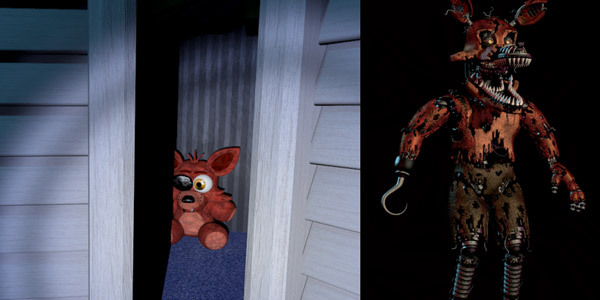 His first phase is just that of him sitting in your closet as a Foxy plushie, after that he will stand up and move closer and closer to the doorway, with each phase raising the urgency to close the closet door. Closing the closet door will cause him to rewind back to the first phase, and thus resetting the cycle. 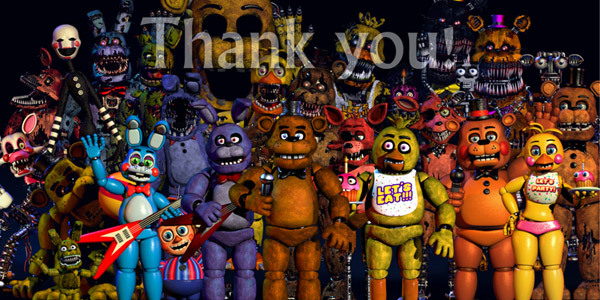 Fredbear only appears in night 5 and night 6, as a sort of “twist character”. 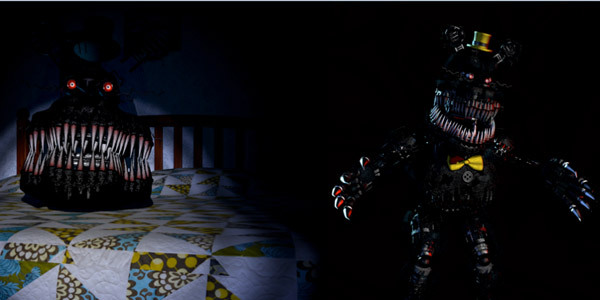 In night 5, he is the only animatronic that attacks you. He comes at you from the left and right hallway, unless you hear his laughter, at which point he is either on your bed or in your closet. On night 6, he is not present until 4 AM, at which point you will hear the laughter again. You must be very cautious and listen for his footsteps to know where he is. 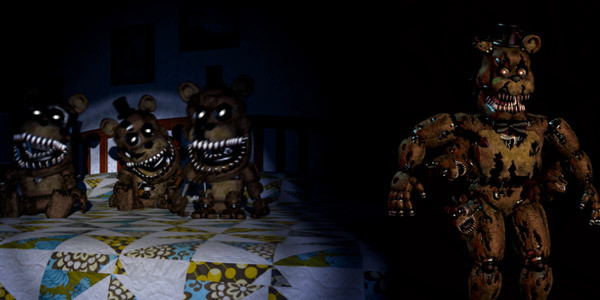 The animatronic simply known as nightmare is much like Nightmare Fredbear. 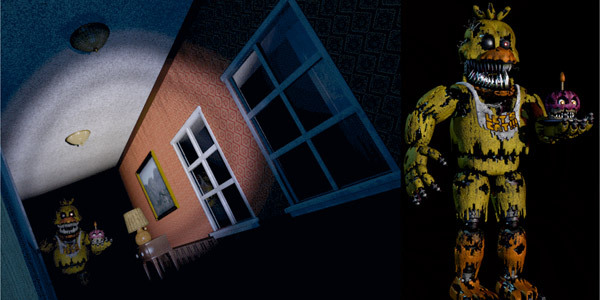 However, he is much more aggressive than Fredbear and only appears on both the nightmare bonus night, and the hidden 20/20/20/20 mode night. His behavior is similar to that of Fredbear’s on night 6. He only comes out after 4 AM, his laugh track signifies both his arrival and his sudden appearance at your bed or in your closet. Be wary however, as when you die by his claws you don’t go back to the menu screen. Instead your game shuts down entirely, heading back to the jumpscare warning screen. 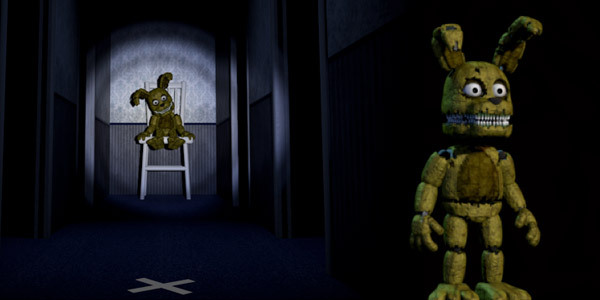 Plushtrap isn’t directly involved in the main gameplay, he is just a minigame that occurs in between nights, the trick to the minigame is to hold your flashlight off long enough to get Plushtrap on the white “X” in front of you. If you hold the flashlight off for too long he will jumpscare you, if you flash the light on him too many times, he will never move. If you manage to succeed in getting him on the white “X”, you get to skip two hours on the next night. Freddy’s World”. He made it very clear that it is not a sequel of the story, nor does in connect with the story in any way. All that we know of is that you can select any of the animatronic characters in the past 4 games, including some extras, and assemble your 4 person “party” an battle enemies in a kid-friendly, non-horror, RPG that will be out sometime in 2016. Scott also announced a new update for the game to be released today that includes a challenge mode for the “Fun With Plushtrap”, a cheat menu for players to mess with the game, and some other new software patches. 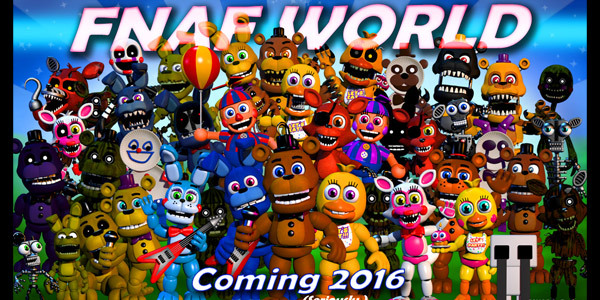 In addition to the new update, Scott is releasing free dlc that is basically FNAF 4: Halloween Edition. 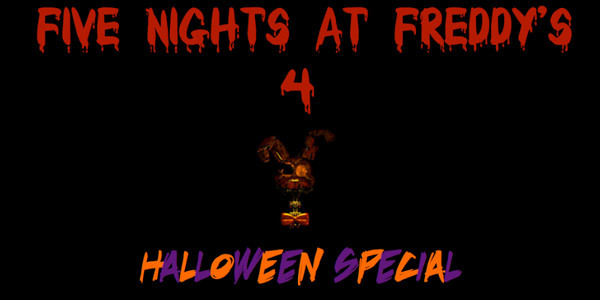 This will be kind of like Infamous: Festival of Blood, and will feature new nightmare animatronics like Nightmare Balloon Boy, Nightmare Springtrap, Nightmare Puppet, and a Nightmare Mangle is rumored to make an appearance in this spooky addition to the game. Scott has also made it clear that this dlc is not canon and will not add to the story in any way, just simply Scott’s way of saying Happy Halloween! While at first, I hated the idea of this game, and I was really thinking how unnecessary this sequel is. I think it turned out to be a really good game. It’s definitely the scariest one to date, as it makes you rely on sound to keep you safe. You need to listen closely to survive, and that goes horribly wrong when you have the moment where you die, and your ears get blasted by a jumpscare. 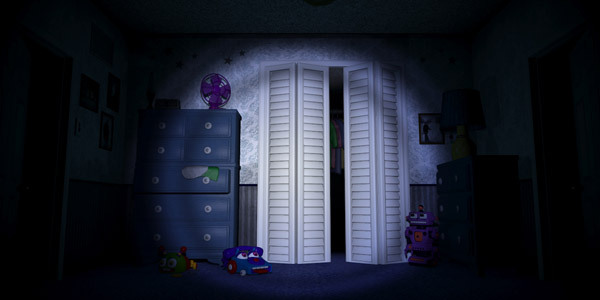 The story was very boring at first to me because they never revealed the identity of the purple man, but then I noticed the small details, and Scott issued a challenge by not opening the box that you see after the nightmare night, and now I consider this one of the better made games of the series. I’d like to personally thank Matthew Patrick of Game Theory for saving my opinion of this game. I hope no one ever forgets these magnificent games for their unique storytelling and innovative gameplay, and it’s hard to say goodbye, but I’ll cope. Besides, who else is going to write about the movie?